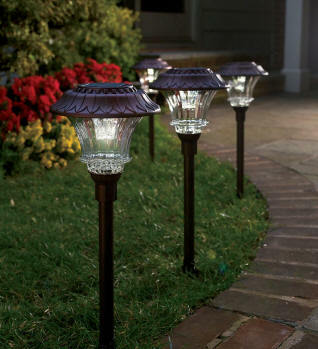 Ever since affordable solar lighting came out for the garden paths, I was hooked on solar lighting. In a region with a lot of sunlight, solar lighting, when feasible, is the way to go. Besides, I think the subtle solar lights at night are just cool looking. This web page covers my experiences with solar lighting. The first solar lights I purchased were an impulse buy at Costco about 7 years ago. They were those little glass pathway lights that you stake into the ground. I believe it was a set of 8. They worked well for a few years but eventually stopped working and were tossed. I do not believe these first generation models had batteries that could be changed. They had also became pretty beat up looking. The solar panel on top fogged over and the male dogs used them to pee on. They were also tripped over a few times during the daytime. Because of the tripping hazard, I have not purchased any more ground staked solar path lights. - Make sure you place them so they are not a tripping hazard. - If you have hard water in your region, and the path lights are hit by your sprinklers, it will leave residue on the solar panel which blocks the light getting to the rechargeable battery. - Don't put the lights where dogs can pee on them. The next type of solar lights I purchased were the solar soji (shoji) lights. 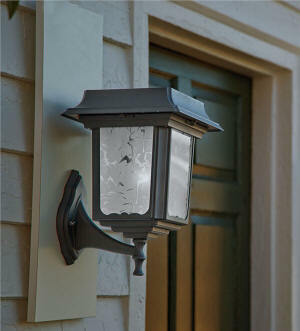 I do continue to purchase this style of solar light when they fall apart. 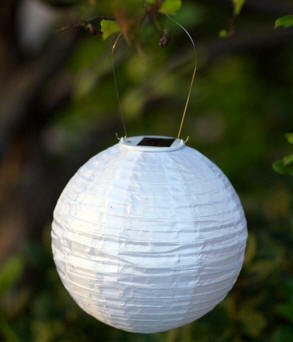 Soji solar lights mimic the Japanese shoji lights made out of paper. Solar soji lights are now all over the internet. The leading manufacturer of these lights, at this time, is a company called Allsop. There are many other manufacturers. They are mostly made in China. The fabric is usually nylon. The top where the solar panel, battery, and LED bulb is housed, is made of plastic. Sometimes the housing is metal. How long will the soji solar lanterns last? Hang it outside and ignore it? 1-2 years if you're lucky. Tend to it by taking it in during bad weather and snowy winters? 2-3 years. 1) You should not be paying more than about $15-$17 as of 9/2016, for a single colored 10" round soji light. If it is a different shape, color, or printed design, you may pay more. I now wait for sales. 2) Regarding the color. The darker the color, the harder it is to even see that the light is on. Since I use the soji lights to light up a few dark areas outside. I usually only purchase the white. If you are going for something more decorative, then yes, the colored ones are nice, but not as bright as simple white. The colors also fade very quickly in the sun. 3) Many of the outdoor photos of these lights show them hanging from trees or under a roof. Hmmm, if they don't get any direct sunlight, they are not going to work, period. 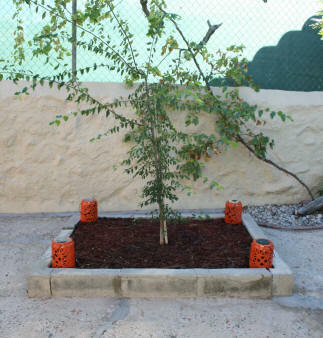 If they get a good dose of strong sunlight per day, at least 6 hours, they will stay lit until the morning. When you place them under a tree with birds, they will get bird poop on them. 4) Inclement weather is a problem. The nylon material does not do well in hail. Hail and strong winds will rip them apart. They can handle a steady drizzle of rain. They can handle some wind if they are hung on something that allows the metal hanger to swing (but not come off) in the wind. Holding the metal hanger rigid will break the plastic off where it hooks through on the top. What do I do now when I know there is bad weather coming? I take them down and bring them inside. 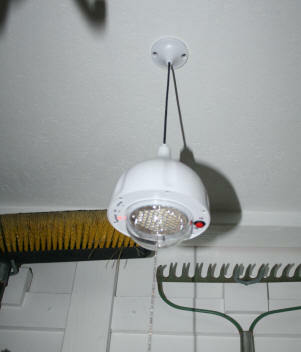 5) Make sure the lights cannot fall down where you hang them.... if you have dogs. Dogs love to tear the soji lights to shreds. 6) If the soji lamp material has disintegrated or has been destroyed BUT the light still works.....Tear off or otherwise remove the fabric and you now have a small solar pin light that you can hang on a bush or tree somewhere for a little point of light at night. 7) If the light stops working, check the battery. Most of the soji lanterns use AAA rechargeable batteries. The AAA are harder to find than the AA, but you can find them out there. The next solar light I purchased was a vine or string lights in little baskets in 2013 from the Plow & Hearth website for $49.95. These specific solar lights are no longer available, as far as I could find. One little quirk... during an evening lightning storm these lights turn on for one second, after each lightning flash. - If the string of solar lights only has one tiny little solar panel, say 2" x 2", the panel is really not large enough to provide power to multiple lights for more than a few hours. 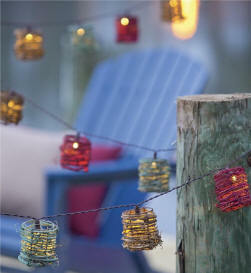 Try looking for string lights with a larger solar panel for longer lasting lights. - Make sure the length of wire between the solar panel to the first light on the string is long enough. This way you can place the panel out in the sun, and have the lights strung in a shaded area. If the plastic solar panel has fogged over you will not be getting as much sunlight to the rechargeable battery. 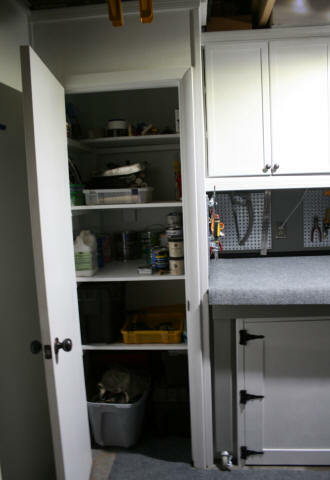 Make the panel clear again by either painting over the panel with clear fingernail polish or clear enamel paint. This crystal clear enamel works great on other fogged over plastic. I used it on the old plastic dial cover on my gas meter. This way the gas meter reader does not have to spray the plastic with water to read the meter. They looked so classy looking, compared to most other solar lights at the time, I could not resist purchasing them....and they were on sale. I was pleasantly surprised when I received them. They were made of metal (cast aluminum?) with etched glass panels. The solar panel was huge, covering the entire top of the light. 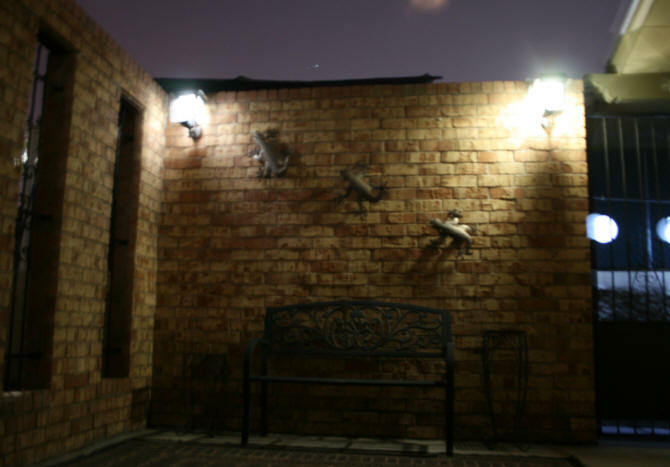 When mounted, you can't even tell they are solar lights. I originally wanted to place them in front of the house on each side of the garage doors. But the roof shades this area most of the day and the two mounting screws on the wall are easy to remove. Which means, the lights can be stolen easily. Backyard, same problem. Roof shades areas against the house. 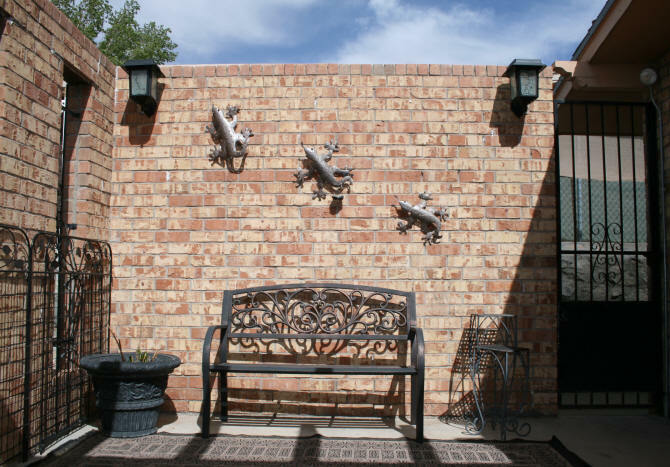 I then came up with idea of mounting them on the brick wall on the front patio. 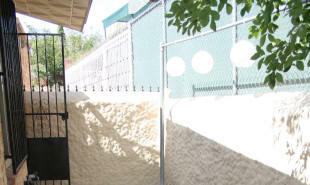 The brick patio wall receives a good dose of sunshine everyday, no roof, patio gate is padlocked. The only problems was the brick. I needed a hammer drill to make the holes to attach the mounting hardware. I then became busy with other life issues and these lovely lights remained boxed for almost a year. Fast forward to April 2014. I purchased a hammer drill and mounted the lights on the patio wall. THESE LIGHTS ARE AWESOME....now that they were installed. Not only did they softly light up the whole front patio, they stayed on all night long. I went online to buy some more. Hah! No longer available. But of course! These lights are still mounted on my front patio and yes, they still work great. BUT...... ah there are always a few quirks. These lights do not use standard rechargeable batteries like an AA or AAA. 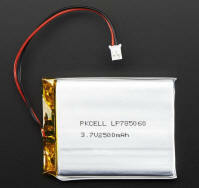 They use a Lithium Ion Polymer Battery - 3.7v 2500mAh. Also know as LiPo batteries. During the winter of 2014, I noticed that lights did not stay on as long. I just left them out, even when we had some snow. When the weather was warmer, the lights stayed on until sunrise. I did some research and discovered that these polymer batteries do not do well when temperatures at night dip into the 40's and lower. So I now bring them in for the winter when the temperature drops to the 40's. I also run out and take them down when there is hail larger than dime. Smaller pea sized hail we have had, has not damaged the panels on top. Fast forward to Summer 2016. The batteries were not charging well. The lights were only staying on a few hours. I went online and purchased two more new LiPo batteries for the lights. Looks like these batteries only last around three years. All of the LED bulbs in the lights are still working. Wall mounted solar lights on front patio brick wall, September 8, 2016. No flash night exposure. 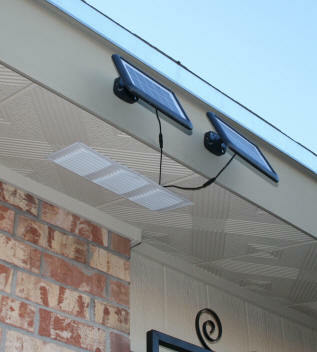 - If you are looking for solar wall mounted lights, chances are the area you want to mount them is under a roof. Will you get enough sunshine there to make them work? If the answer is no, but you still want to put a solar wall mounted light there then look for the lights where the solar panel is not on the actual light fixture. There will be a wire to a solar panel that you can mount in the sun. These are a little harder to find, but they are out there. - If you want a bright light, two things are needed. A bunch of LED bulbs. Look at the count. For something to put off a decent amount of light, there needs to be 20 or more bulbs on one fixture. The second thing to look for is a large solar panel. A little 2" x 2" or smaller solar panel is not going to light 20 LED bulbs for very long. Particularly if the light is only using a AA rechargeable battery. - LiPo batteries have more staying power (except in cold temperatures). They are more difficult to find than standard batteries but you get more bang for the buck. Also, keep these batteries away from kids and pets!! Handle with care!! 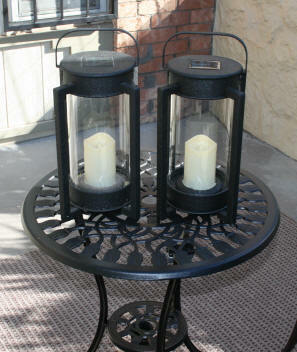 The next type of solar lights that I purchased were table top or deck lights. 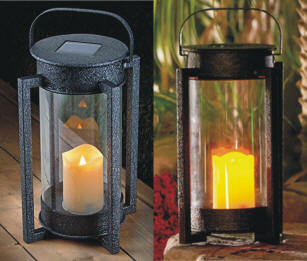 On the Improvements website I found these Portsmouth Solar Metal Lanterns on sale and purchased 2 at $37.42. I eventually bought 2 more because I liked them so much and they were marked for clearance. Yep, no longer available. But there are similar lights on the marketplace. 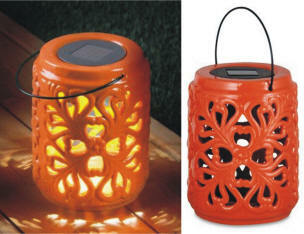 Just search for hurricane solar lamps. The frame is metal. The faux candle casing is glass, not plastic. The light bulb used inside is a flameless LED candle that emits a soft flickering amber glow. 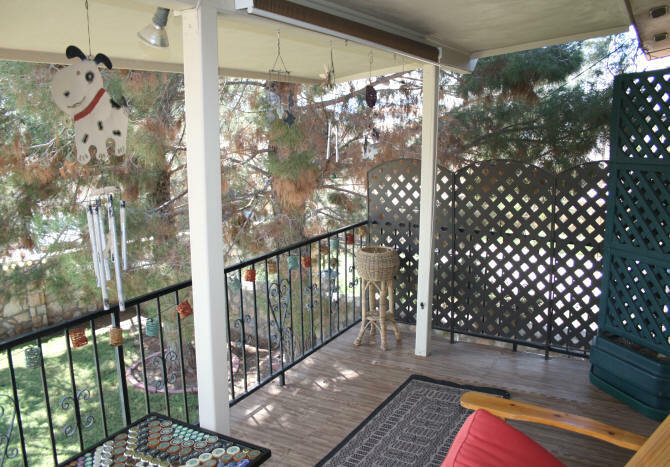 The solar panel is located on top of the light fixture. With a good 6 - 8 hour charge, they last all night long. For this particular light, I use them inside as night lights on tables around the stairs in my house. They emit enough light to allow me to walk around my house at night without turning on any electric lights. In the morning, I set them out in the sun. At night, I bring them in. I am not sure how waterproof they are because I bring them inside if it rains. Also on the Improvements website, I purchased some Porcelain Etched Floral Lantern which were marked for clearance. I knew this was a one shot purchase, so I bought 4 for $35.92. I liked them because they were kind of a combination of luminaria lights and papel picado. They are not porcelain, but I knew that when I bought them. They are just ceramic. The solar panel on top is removable. 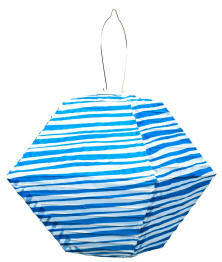 In fact, it is exactly the same size as the solar unit on the soji lanterns. The light is very subtle. It is less bright than the photograph. One thing I discovered was that the solar panel was not waterproof. Which means, after a rain, the lights would not work until they dried out. I cut up a Ziploc freezer bag (thicker) and placed the plastic over the top and inserted the panel back into the top of the ceramic. Now it lets the sun in, but keeps the water out. I used these lights to light-up the raised plant bed on my terrace patio. I recently planted a hack berry tree in this area. When the tree gets larger, shading the area, I will move the lanterns someplace else. - Since these lights are assuming you will use them in a protected area, they may or may not be waterproof. If they are not waterproof AND get wet and stop working. Usually when the light dries out, it will start working again. Give it a few days to do this before you toss it. On one light, I took the panel apart, drained the water, and let it dry. When I put it back together it worked great. You can try covering the panel with something clear to keep water from entering like I did with a cut up Ziploc freezer bag. For this type of solar light, I needed something different. All of the decorative lights above functioned the same way. They sit out in the sun all day. When the sun goes down, the light comes on. For the inside of my garage, I needed a regular light.....that just happened to be solar powered. 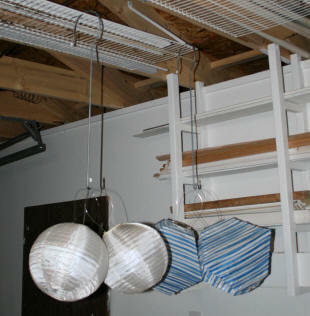 The electrical wiring in my garage is not robust enough to handle extra light fixtures. I occasionally trip the circuit operating my table saw. So I needed some area lights in my new closets and above the new workbench. Something that would work in the daytime. The solar lights that I purchased are called: MicroSolar Super Bright - Lithium Battery - 60 LED Solar Shed Light - Power Adjustable. The lights work during the day, which is what I needed. They are basically a regular LED light that just happens to charge it's batteries with a solar panel. At night. Only solar light on. Able to see inside closet easily. Solar lighting takes some work. Unlike electrical lighting, with solar lights, there are batteries to change, fogged up lenses to refresh, weather considerations, etc. etc. So why bother at all?? Besides saving on hiring an electrician to put in electrical wiring, where it does not exist, so you can have light AND being off the grid, you still have to pay for the light itself and and eventually buy new rechareable batteries. So why do I bother? I like them and they do come in handy. Particularly during a power outage and in my garage. If there is a zombie apocalypse and the electrical grid goes down, my house will still be lit-up for a couple of years until my solar batteries die or the lights are destroyed. If the sun burns out in a billion years, the lights will be worthless.